The Educational Technology Innovation Center (ETIC) supports faculty in developing technology integrated, blended or online courses. Support is mediated through instructional design aide, technology training and guidance, and eLearning project management. The Higher Colleges of Technology (HCT) was established in 1988 with the intention of providing world class, high quality education in the UAE. In 1994, it received international recognition for its commitment to excellence and innovation in higher education when UNESCO awarded it the Comenius Medal for Outstanding Educational Achievement. Starting with four colleges and 64 graduates in the first graduation year, HCT has grown to include eight more men’s and women campuses and over 4000 graduates each year. HCT’s constant endeavor to adopt new teaching and learning technologies and methodologies leads it to support new eLearning initiatives. To succeed in the global, computer-literate work environment, HCT students needed to acquire the skills and attributes related to ICT in a global workplace. HCT therefore supports the use of eLearning technologies in education to provide an opportunity to prepare students in the usage of IT-based tools, and to encourage self-drive and independent learning. The Educational Technology team is available to assist and support faculty and staff in their eLearning projects. Our goal is to ensure the effective use of ICT for the support and delivery of instruction and assessments. The Educational Technology Innovation Center (ETIC) supports faculty in developing distributed learning courses, blended-learning courses, or online courses. The three main delivery types are defined in the following table and figure. HCT employs the LMS Blackboard Learn 9.1, which is an academic enterprise system that supports eLearning. It primarily provides an online platform for teachers and students to access their class materials and interact with one another from anywhere in the world. The dynamic learning information management of Blackboard helps instructors gather and use learning process information to meet institutional and course goals. Every HCT course/section has an accompanying LMS (Blackboard) course/section where student assignments are collected. The LMS course contains appropriate assessment tools and a gradebook for all course work. Coursework submitted by students in the LMS courses/sections is made available to them throughout their educational period at HCT as an element of ePortfolio. The flexibility afforded by eLearning makes it possible to include the latest technological developments accessible online. Among these are Web 2.0 tools that teachers can utilize in their courses, such as wikis, blogs, social groups RSS, video, podcasts, tagging and other socially-generated media on the Internet. Technology Integrated f2f Learning (TIF): Face-to-face (f2f) instruction that integrates eLearning (technology-based) educational experiences. In this model, classroom teaching is still the main essential component and makes up 80% or more of the course hours. An LMS (Blackboard) course is created to host the eLearning resources so as to supplement this teaching. Blended Learning A hybrid/mix of face-to-face instruction and distance instruction where a portion of the course hours are conducted online either asynchronously (different time and different places) or synchronously (same time but different places). From 20% up to 60% of the course hours can be online, while at least 40% of the course hours must remain face-to-face. 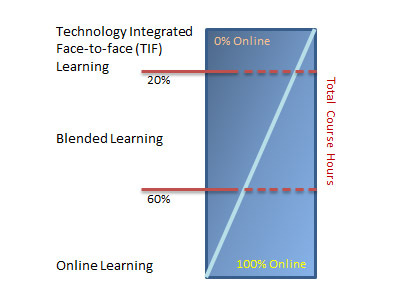 Online Learning Where >60% of the course instruction is online using eLearning technologies and an LMS (Blackboard). There is minimal face-to-face interaction between the student and teacher, and all learning material is hosted in Blackboard. The teacher and students communicate via the discussion forums, chat rooms, instant messaging, by phone and with email. The entire course is organized in such a way that students are able to learn at their own pace yet respecting the deadlines for their online quizzes and assignments. Training – Instructors may complete a diverse selection of eLearning training programs. Topics range from use of educational technologies in the classroom (Tablet PCs, Smartboards, etc.) 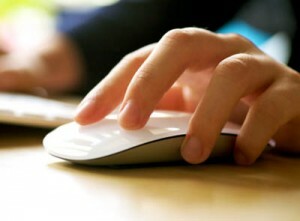 to the design and delivery of quality blended and online eLearning courses. View our Workshops & Training page to see what the latest and upcoming events are and to register. Click here to access our training, workshops and seminar pages and information. HCT uses Blackboard as our learning management system (LMS). All Faculty can have an associated Blackboard course shell created upon request, and then may design their own blended eLearning course. The Central Services Ed Tech Innovation Centre and team are here to assist faculty with any of the following: help them in creating digital learning objects (DLOs), help in quality instructional design within the Blackboard course shell, training and support in using Blackboard and its associated technologies, and general training and help on methods and techniques in blended and online learning courses. For fully online courses, faculty should submit a course proposal to their DAT, or request design support from the CS EdTech team for DAT approval. The ETIC department at ACS works as the project management body and coordinates the development of the online assets with teachers and external vendors. In short: The EdTech team is here to support faculty as requested in design and creation of online courses, media and digital learning objects. Just contact us!